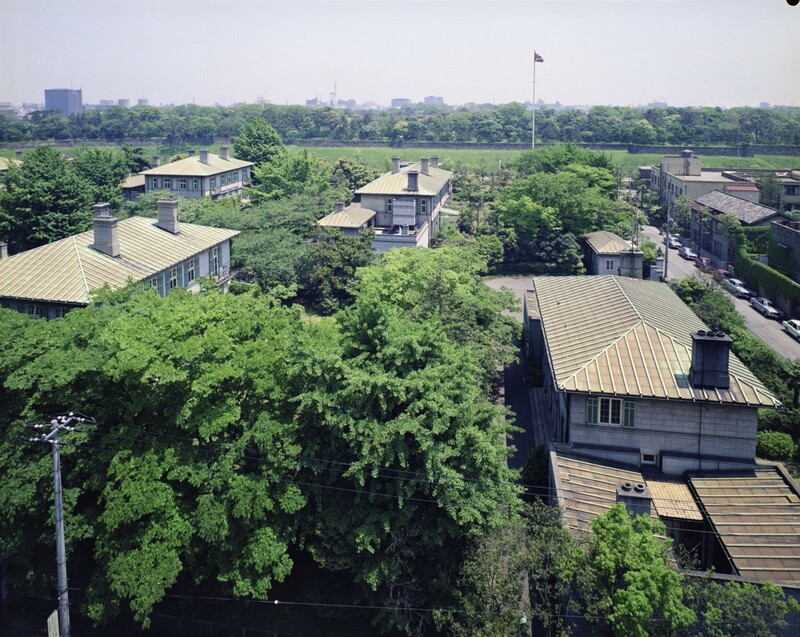 Southern end of the Tokyo compound, looking east to the grounds of the Imperial Palace, 1970. The British signed a convention in 1854 at Nagasaki that gave their ships access to the ports of Nagasaki and Hakodate for repairs and supplies, but it gave them no rights to reside in, nor trade with, Japan. In 1858, a treaty provided for the appointment of a ‘Diplomatic Agent’ to reside at Edo and for five ports to be opened for commerce under extra-territorial arrangements. These were Hakodate, Kanagawa (the port for Edo), Nagasaki, Niigata, and Hyogo (the port for Osaka). Rutherford Alcock was appointed in 1858 as Britain’s first consul-general in Japan and he oversaw the establishment of the first consulates. In 1859, he arrived in Edo to establish the legation there. (Edo was renamed Tokyo, ‘eastern capital’, upon the restoration of the Meiji dynasty in 1868, to distinguish it from Kyoto, ‘capital’.) The Tokyo legation became an embassy in 1905. All the buildings on the Tokyo compound were destroyed by earthquake and fire in 1923. Chuzenji was the head of mission’s summer retreat.